The Beijing Subway is an epic element of “daily life” (as they say here in Beijing) my end. Whilst I don’t ride it day in day out, I do ride on it religiously enough that I’ve been to most stations (though not all, unlike London at the moment), and I’ve seen a few Chinglish fails. So City Hall got me the chance to speak to 90 of the Beijing Subway’s “Ops-3” (Third Operations) company. These guys manage Lines 2, 8, 10, and 13, which included the city’s two loop lines, and the arc line as well. We also went over the basic, included ten phrases used in ten situations — gateline English, at the platforms, to deal with interchange routes, and many others. I did the Everyday Rail English books in late 2017 so to clean up on China Railway’s epic mistranslations (they run great trains, but some translations are just totally random). It was bilingual for the sole fact that they had to have something to read in English, but all the descriptive text and others remaining in Mandarin Chinese. Like my Chinglish book, it found itself an unexpected international audience. There is hearsay this book made it big in the Belgian community in Beijing, both civilian and diplomatic (!??). As a result, this book began an unexpected second life as a book semi-primed for expats as well (supposedly so they could probably use pre-canned phrases to navigate their way around the rail network). This report was first published in Chinese on 16 April 2014 by reporter Wang Dongliang of the Beijing Daily. The Handbook of Everyday English was released yesterday by the Beijing Municipal Foreign Affairs Office and the Beijing Speaks Foreign Language Committee, amongst other bodies. The WeChat and e-learning channels were launched at the same time. Residents are now just taps away from learning English. Ni Hao, Zhong Guo Tie Lu! Did the official, national China Railways Weibo account just start tweeting things in English? If everything was in Chinese back then, it made sense. But then we had Deng’s reforms. Then we had the Olympics. The World Expo. The Asian Games. Two Universiades. You got people from all creeds, all religions, all countries and territories, in essence pouring into the country and onto our trains. (I’m typing this in a café with Italians next to me!) It kind of made sense to be bilingual. Bilingual signage popped up everywhere — at Beijing South, on trains, everywhere. For a moment, most of us believed our railways turned bilingual overnight. 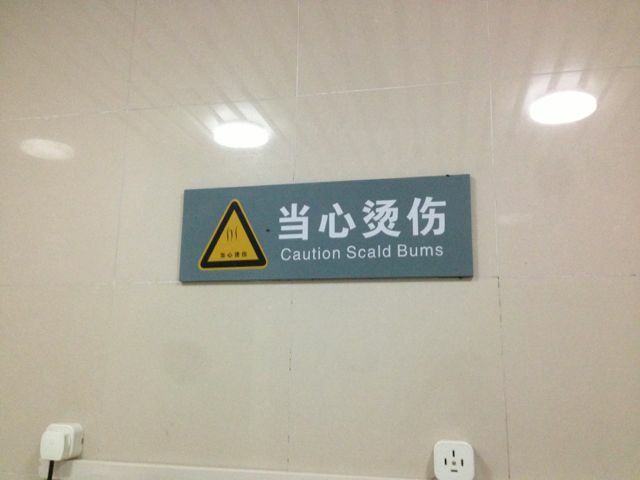 I’ve done 100,000+ km in China, and man do my bums hurt. But unfortunately, they’re getting all the station names wrong. Some even are off-colour. The “standard” expression for “un-Chinglish” would, of course, be English, but I had to point out the “un-Chinglish” bit. One has to, when one sees what the station’s been through. 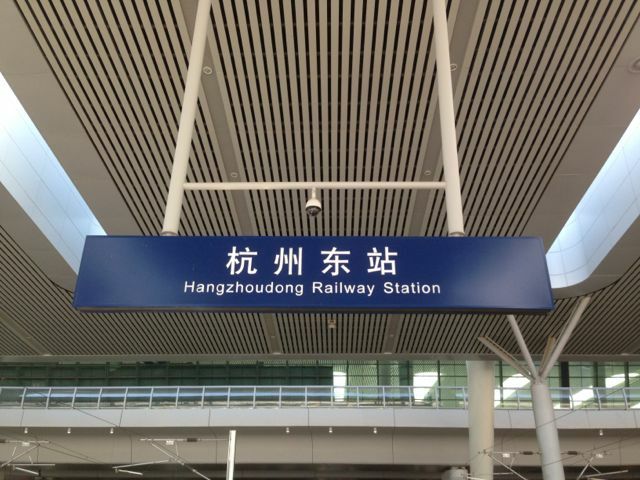 A few years back, Platform 1 was given a Chinglish name, as I saw in my February 2013 trip to the Zhangjiakou South Railway Station. In March 2013, I started redoing their sign after I linked up via Weibo to one of the people in charge of stations around Greater Zhangjiakou. I redid all of their signage onboard Train G71 whilst it sped from Beijing West to Changsha South. These guys sure were happy: they were spared the design fees (and got Swiss design instead). After a bit of a hard time coaxing the station bosses to get the sign up and ready, in late May — that’s just recently — they got the signs updated. I will be appearing with wife Tracy on Sunday, 08 April 2012, from 18:00 through to 20:00 (Beijing time) on Top FM 101.8 on China National Radio (CNR). We’ll be talking about trains and Chinglish! For the full two hours (which is quite a bit when you think about it), our live show will go through the amazing stories of my 120,000+ km of train travel, 2,200+ Chinglish shots, as well as my travels in nearly 20 countries and territories. I’ll also do a bit of “multilingualism” over the airwaves. The three-week educational working visit to Harbin’s come to an end today. It’s been three weeks of Chinglish. During this trip, my iPhone’s ran into about 25 cases of new Chinglish in Harbin. I’m up to about 2,200 cases of the concoct language, and while it’s far from perfect, I did like one of the most recent Chinglishes I found this morning — that the restaurant lies on the second floor, complete with the MAIE RESTROOM. Now just how do you pronounce the latter? Our train tickets are with us: we’re headed back to Beijing in the next few days. I leave behind a Harbin I’ve found more crazy Chinglish in (and even up north in Bei’an), but also a Harbin I’ve tried to de-Chinglish-ify as much as possible. You will be informed when a relevant event is announced. The illegal use of this website is a civil / criminal offence as defined by applicable law.